2012 was a pretty good year for Civil War titles featuring United States Colored Troops, but from what I’ve found so far, 2013 is shaping up to be an even better year. This past year saw such outstanding titles as Levin’s Remembering the Battle of the Crater: War as Murder, Bryant’s The 36th Infantry United States Colored Troops in the Civil War: A History and Roster, and Coddington’s African American Faces of the Civil War: An Album. If you know of any other titles I've missed, please leave them in the comments section. And keep an eye out for The First Battle of Deep Bottom: Grant vs. Lee North of the James by yours truly in 2014! 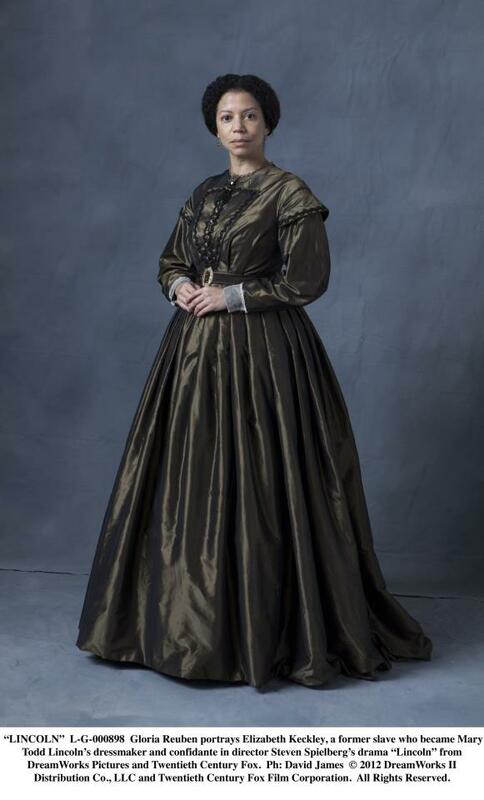 The tragic and triumphant experiences of Mary Todd Lincoln’s seamstress and confidante Elizabeth Keckley have been the subject of a handful of books over the past 15 years, and they have recently come to life on the big screen with Steven Spielberg’s Lincoln. While most may be familiar with the narrative of a talented young woman who rose from the horrors of slavery to be a privileged witness to the inner workings of the Lincoln White House, the scene in which a fictional dialogue takes place between the president and Keckley outside the Executive Mansion introduces the viewer to a fact that even I was unaware of – that Keckley had had a son who served in the Union army and was killed in battle. 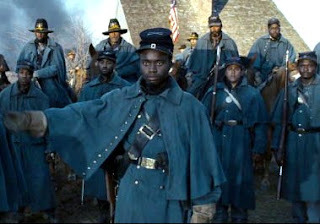 As soon as that line left Gloria Reuben’s lips, my mind immediately leapt to the obvious question – was this son of hers a member of the United States Colored Troops? After a little digging, I soon found my answer. Before delving into the details of the short military career of Keckley’s son, a little background is in order. “Lizzie” Keckley was born into slavery in February of 1818 in Dinwiddie County, near Petersburg, VA. She eventually wound up in Hillsborough, NC where here owner, Hugh Garland, “married” her to his neighbor Alexander Kirkland. This basically meant that she was a concubine and, in her own words, Kirkland “persecuted” her for four years, an experience that was “fraught with pain.” This abusive union resulted in a son being born, whom the father named George. Thankfully for Keckley, Alexander Kirkland died when their son was only 18 months old. The son, originally referred to as “Garland’s George,” would eventually earn freedom along with his mother when Keckley paid $1,200 for their freedom in 1852. George would grow into a capable boy and go on to attend Oberlin College. By the time of the Civil War however, George – who sometimes went by his middle name William – adopted his father’s last name of Kirkland and enlisted as a white man in the 1st Missouri Volunteers – a 3 month militia unit that would be redesignated the 1st Missouri Light Artillery. He entered the service on April 24, 1861 The 1st was one of several unofficial pro-Unionist Home Guard militias formed in St. Louis in the early months of 1861 by Congressman Francis Preston Blair, Jr. and other Unionist from Missouri. They would elect Blair as their colonel, with Nathaniel Lyon in overall command of the Missouri volunteers. 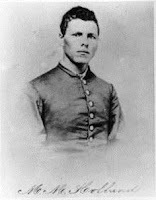 Kirkland was with the 1st when they went into action at Wilson’s Creek on August 10, 1861, and it was there in the Ray family’s corn field where he was killed. It is unknown if his body was claimed, or if he was buried on the battlefield. 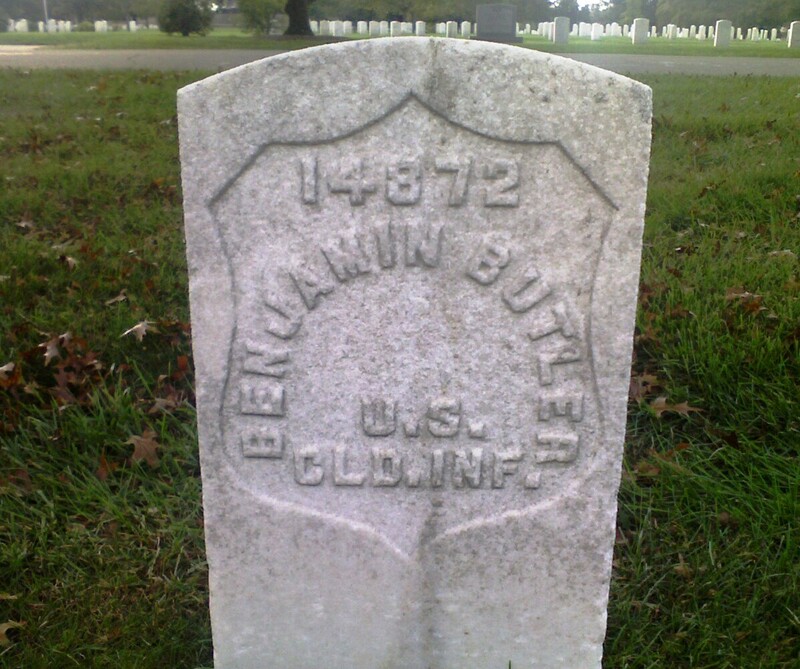 If he was buried on the field, he may be in one of the 689 unknown graves at Springfield National Cemetery, where all of the Union dead from Wilson’s Creek were moved after the war. 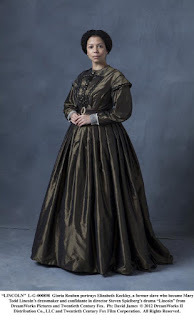 Keckley received a pension starting in September of 1863 with the help of Owen and Joseph Lovejoy and was paid $8.00 a month until her death in 1907. It is interesting to note that she makes scant reference to George in her autobiography – indeed, she spends a much greater amount of type space devoted to the death of Willie Lincoln, and only references the death of her son to illustrate how she could relate to Mary Todd Lincoln and comfort her in her time of grief. In the end, we are left with many questions. Was Kirkland’s choice to join in 1861 a rejection of his black blood or was it simply his way around the fact that he otherwise would not have been able to enlist at the time? Was Keckley’s scant reference to him due to the painful reminder of four years of abuse that her son embodied? Was she angry at him for casting aside his black identity to adopt his father’s name and serve as a white man? We may never know. As the story of Elizabeth Keckley continues to unravel and new generations are exposed to her remarkable story through Spielberg’s film, we may one day have an answer. Well, I hope that everyone had a wonderful Thanksgiving and is prepared for the insanity that is Black Friday. I had the pleasure of viewing Steven Spielberg’s Lincoln on Wednesday evening and, while I am still sorting through my own feelings about the film itself, suffice it to say I was extremely impressed and any historical errors I may have found pale in comparison to the sum of what may very well be the best Civil War era film we will ever see in our lifetime. Before I went to see the movie I was interested to know what other historians had to say about the film and it’s overall faithfulness to the historical record. 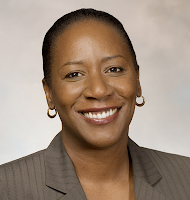 And when Kate Masur published her critical review in the New York Times, stating that African Americans were portrayed as being passive spectators rather than active agents in the process of their emancipation, I thought that this could be a potentially devastating critique, if true. And I must admit I paid special attention to how Mr. Spielberg portrayed the few African American characters (many of whom, I should mention, are United States Colored Troops) when I finally got to view the film. In the end, I think that Masur went too far in her criticism. For instance, she states that “Mr. Spielberg’s ‘Lincoln’ gives us only faithful servants, patiently waiting for the day of Jubilee.” Perhaps she missed the opening battle sequence which showed USCTs locked in mortal combat with Confederate soldiers? These African Americans were hardly being “passive” when they were shooting, bayoneting, punching, and drowning their enemies and then later bragging that they had killed 1,000 without taking a prisoner. Masur also criticizes a fictional dialogue between Lincoln and Elizabeth Keckley in which Lincoln admits his unfamiliarity with African Americans and his ignorance of how they will fare after slavery has been abolished. While Masur criticizes this scene for being “awkward” and diminishing Keckley, I found the scene to be powerful and refreshingly honest. 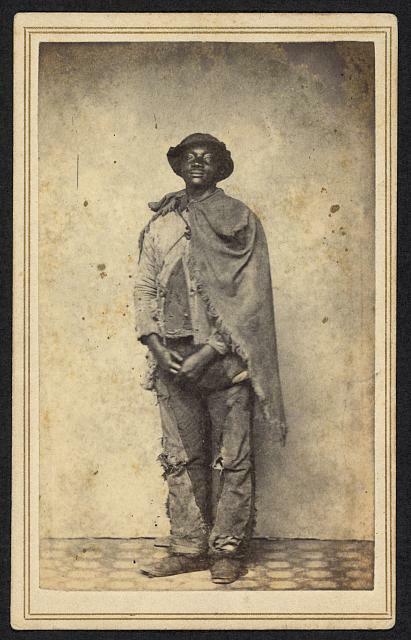 Hari Jones of the African American Civil War Memorial has responded to many of Masur’s criticisms in his latest blog post, which can be found here. It is easy to bring an entire career’s worth of historical training and inflict it upon a film that is not attempting to be purely a history lesson. While there are some things that Spielberg and company got wrong with this film, I consider it a minor miracle how much they got right. Taken From: View of transparency in front of headquarters of supervisory committee for recruiting colored regiments, Chesnut Street, Philadelphia, in commemoration of emancipation in Maryland, November 1, 1864. In a previous post, I raised the possibility that some of the Custis-Lee slaves who had resided at the Arlington estate may have joined the U.S. 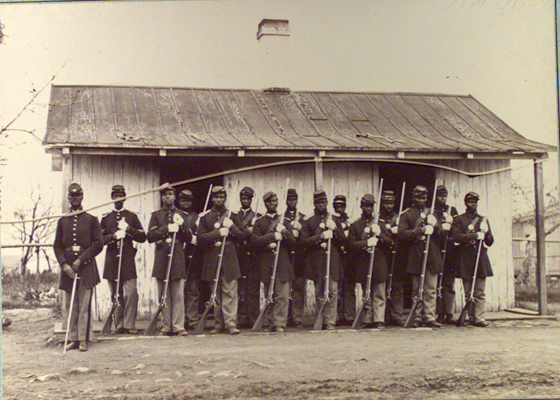 Colored Troops due to the nearby location of Camp Casey – a training ground for many USCT units located near the present-day site of the Pentagon. To ponder the irony of a slave that Robert E. Lee had overseen taking up arms as a USCT was a fun “what if” – but could I prove it? Well, I present to you Lucius Bingham. The name “Lucius Bingham” as it pertains to Arlington House first appears in the 1858 inventory that was taken following the death of Lee’s father-in-law, George Washington Parke Custis in 1857. 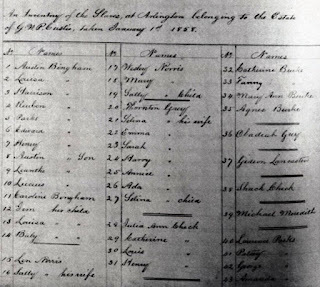 The 63 members of Arlington’s enslaved community are listed each by name and in family groups. The husband/father is listed first followed by the wife/mother and then the children. Seven interrelated families (the Binghams, Burkes, Checks, Grays, Norrises, Parks’ and Taylors) worked at the Arlington plantation. Many of them or their ancestors had come to Arlington with Custis from Mount Vernon in 1802. 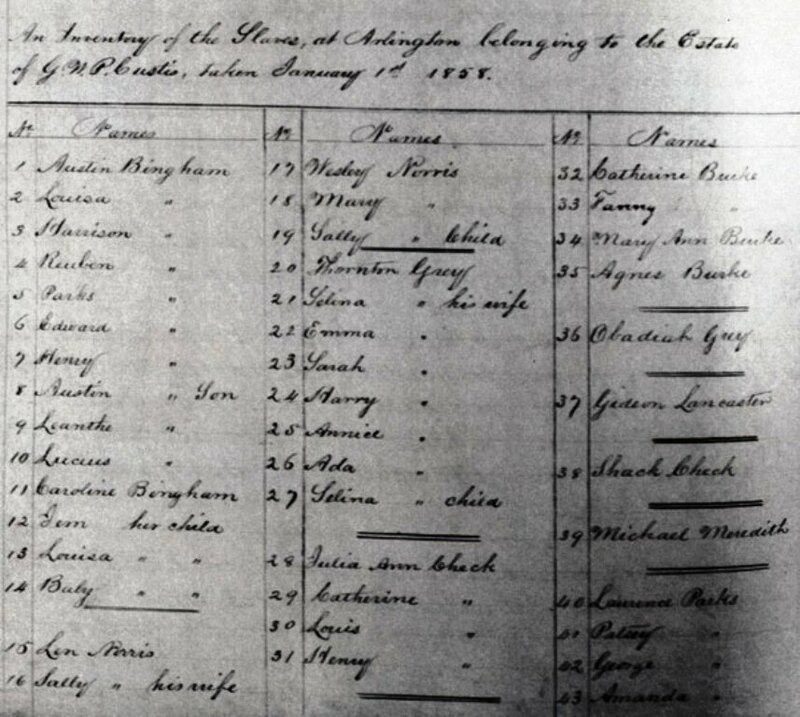 Unfortunately, there are no birth dates or ages on this inventory but since Louisa and Austin Bingham are listed as Lucius’ parents, we can gain some insight into how old he was. Louisa would have been 58 years old when this inventory was taken, which would put her youngest children in their late teens and early twenties considering how many children she had. The Custis Slave Inventory. The Bingham's are on the far left. Now, I wish I could say that Bingham went on to have an illustrious military career (the 38th was at New Market Heights, after all) but he served a one year term of enlistment starting on February 28, 1865. According to his Compiled Service Record, he accompanied the 38th to Texas after Lee’s surrender and was then mustered out when his enlistment expired. And after that, the trail goes cold. 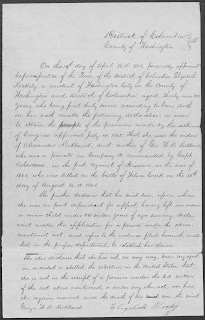 NARA has no record of Bingham or his widow (assuming he had one) filing for a pension, so it is going to be a difficult challenge to put the pieces of the puzzle together and say with certainty that the Lucius Bingham who was enslaved at Arlington is the same Lucius Bingham who fought for liberty in the USCT. But I think a good circumstantial case can be made. So what would it mean if Bingham was a Custis slave who went on to don Union blue? Well, the “Lee didn’t own slaves but Grant did” crowd would be hard put to explain why a slave that Lee controlled at Arlington would jump at the opportunity to enlist in the Union army. I would imagine that a happy slave who was well treated would not be over eager to put his life on the line to join the army that is battling a Confederate army under the leadership of his former master. Also, if more information can be found on Bingham, it may help tie together the story of Arlington’s slave families. Some families such as the Syphaxes are well documented and individual stories such as those of Selina Gray and Jim Parks help shed light on this neglected topic. Finding out more about a member of one of the largest slave families at Arlington will undoubtedly assist in fleshing out the slave narrative at Arlington House. As always, I will continue to research this fascinating “what if” and report any new findings here on The Sable Arm. Did Arlington's Slaves Rise Up To Fight Robert E. Lee? Most students of the American Civil War are familiar with the story of how Arlington National Cemetery was created – in the spring of 1864 when the need arose for a new burial ground near the nation’s capital, Quartermaster General Montgomery C. Meigs sought to kill two birds with one stone. By locating the cemetery on the grounds of the Arlington estate, Meigs found ample ground for new grave space and had the opportunity to ensure that his prewar acquaintance -- Robert E. Lee – would not be able to come back to the place he had called home for 30 years. 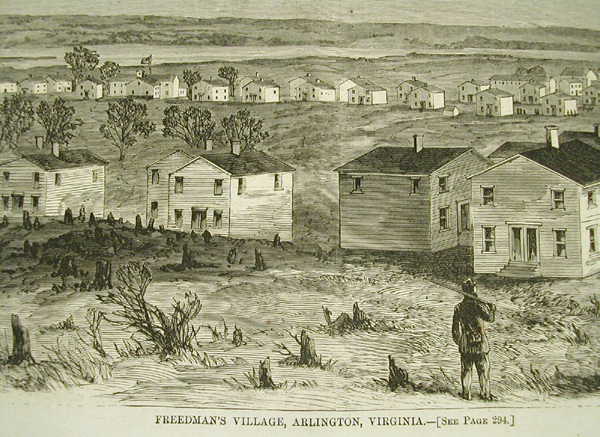 A lesser-known but equally compelling story related to Civil War Arlington is that of Freedman’s Village, where newly-freed slaves came by the thousands to work government farms and receive a rudimentary education. Sojourner Truth worked at Freedman’s Village for one year during the war, and many Northerners eagerly followed the accounts of the famous contraband camp on the grounds of the Custis-Lee Mansion. The tale of Union war dead (many of whose deaths could be traced back directly to Lee’s army) being buried at Lee’s home and a contraband camp situated on the site where approximately 60 slaves had toiled is rich in irony. But what if the irony went even deeper than that? 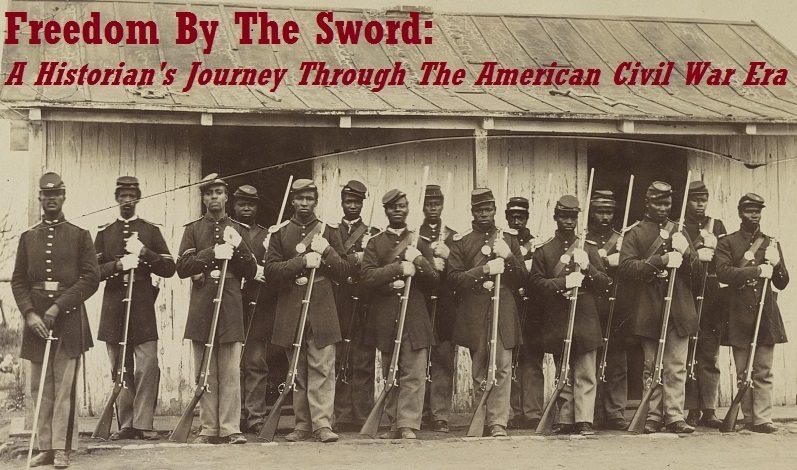 What if thousands of United States Colored Troops were taught the rudiments of being a soldier on the grounds of Arlington as well? Enter the tantalizing mystery of Camp Casey. I first ran across the story of Camp Casey when I joined the recreated 23rd USCT last year. The original 23rd was organized at Camp Casey in late 1863 was sent south from there in 1864, just in time for the Overland Campaign. But the 23rd was far from the only African American unit trained at Camp Casey. The 2nd, 28th, and 29th USCT (to name a few) spent time at Camp Casey as well. Circumstantial evidence comes from a War Department document from November of 1864 authorizing Charles Syphax to sell food and other items “to the soldiers within the limits of Camp Casey, Va until further orders.” Charles Syphax oversaw the dining room at Arlington and lived on property adjoining the original 1,100 acre estate. Given the fact that Syphax was in his 70’s in 1864, Camp Casey must have been near his residence. Confusing matters is the fact that there were at least two other camps in the nearby area named after Silas Casey – one in Bladensburg, MD and another near Shooter’s Hill in Alexandria. Both are too far away to see Arlington House and nowhere near the location of Fort Albany. This makes sense because Casey commanded the Provisional Brigade, which unbrigaded USCT units were a part of. I have examined at least a dozen different maps of Arlington and the surrounding area and Camp Casey doesn’t appear on any of them. Defenses of Washington. 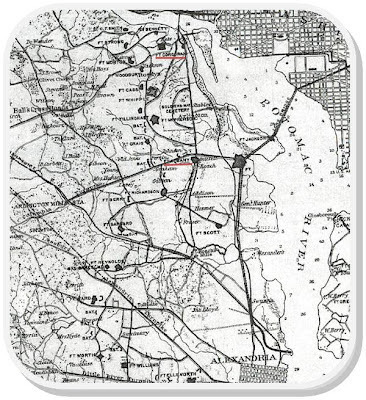 Note the location of Ft. Albany and its proximity to Arlington House. ﻿ ﻿﻿﻿﻿However, it seems safe to say that Camp Casey was very near – possibly on – the estate that Lee lived at for over 30 years. If Camp Casey can be pinpointed to be on the Arlington site it would add yet poignant and significant dimension to a place already steeped in Civil War lore. 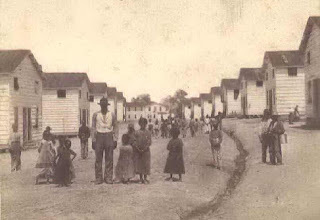 It also leads to a very tantalizing question – if Camp Casey was on the Arlington estate and many slaves from the nearby area came to the camp to enlist in the Union army, did any of the Custis slaves whom Lee would have known very well take up arms and fight against him? To illustrate how amazing this possibility could prove to be, let me illustrate by giving a hypothetical. Let’s suppose that one of the male slaves at Arlington ventured into Camp Casey and joined one of the units that would soon be embroiled in the Battle of the Crater. By some miracle, he survives the battle and is taken prisoner. 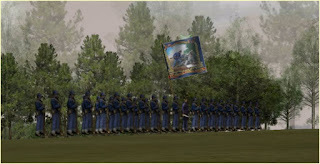 As he is being marched to the rear, he walks by Lee and some of his staff who have ridden up to take in the situation. Lee is utterly taken aback by that fact that he recognizes one of the black faces being paraded by him. It may seem far-fetched, but we do know that nearby slaves did wonder into Camp Casey and enlist. 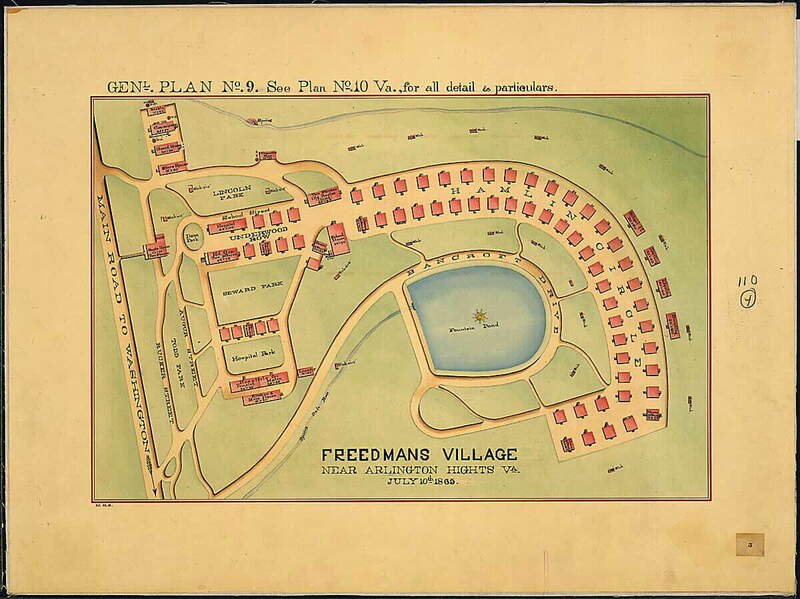 We even have records of the commandant of Freedman’s Village complaining that members of the 23rd USCT were going into the contraband camp and forcing young male slaves to join the army (the 23rd took the highest casualty rate of any USCT unit at the Crater). 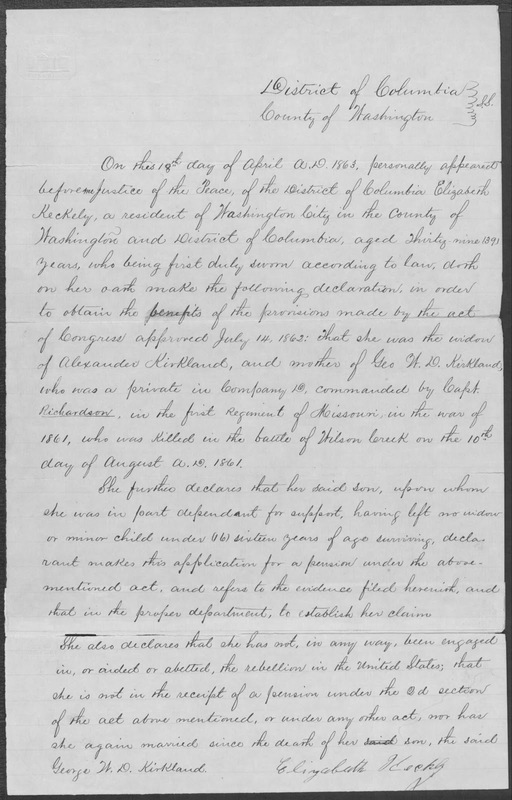 We may have even found a Custis slave who joined a USCT unit (more on that later). As far-fetched as it may sound, my mind starts to race when I contemplate the significance of such a hypothetical encounter! My search for Camp Casey and the underlying implications of its location, then, will be a major feature of my research as my stint as a Park Ranger at Arlington House continues. Any breakthroughs will be reported on The Sable Arm, and if anyone out there has any insights on this matter, please shoot them my way. Greetings and happy summer to everyone! I apologize for the dearth of posts over the past three months – life has been crazy as of late. I’ve had the privilege of working at Arlington House: The Robert E. Lee Memorial since May and I’ve had a blast delving into the history of America’s most hallowed ground. For those of you who may be interested, we will be commemorating the 181st anniversary of the marriage of Mary Custis to God’s Second Son (Robert E. Lee to you mere mortals) this Saturday with period dancing, burnt sacrifices and offerings to Ole Marse Robert, and more! Also going into effect soon will be a Civil War tour led by yours truly that will explore the history of Arlington House during the Civil War and visit the graves of such Civil War luminaries as John Gibbon, Phil Sheridan, Johnny Clem, Fighting Joe Wheeler, EOC Ord, Hiram Berdan, Phil Kearny and more! 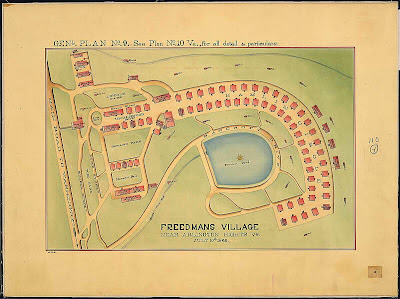 One fascinating aspect of working at Arlington House is getting to know the little-told tale of Freedman’s Village, a contraband camp that was transformed into the first home that thousands of former slaves would live in as free people until it was shut down by the government in 1900. 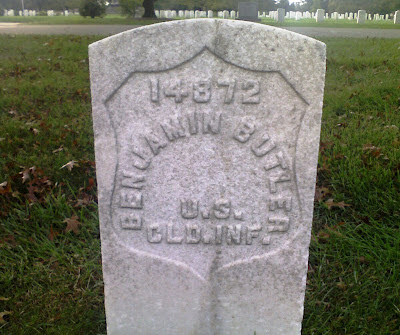 In terms of the USCT story, over 1,500 USCTs are buried in sections 27, 23, and 13 including Medal of Honor recipients from New Market Heights. 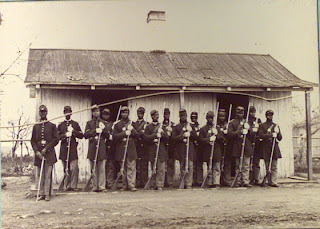 In addition, Fort Corcoran, training ground of the 107th USCT (seen below in this famous photograph) was located on the former grounds of the estate that Robert E. Lee knew as home for 30 years. I hope to post more on Freedmen’s Village and United States Colored Troops buried at Arlington in the near future, but until then please stop by and say hey. New Market Heights, The Game? Great detail on the flag. In the latter part of August, 1864, his regiment moved to the right in front of Richmond at Deep Bottom. It was at this point that his regiment made its brilliant and famous charge on the 29th day of September, 1864. And it was there that Sergeant Major Holland led the assaulting company of his regiment in their famous charge. Brilliant as had been its past record, and courageous as the men had shown themselves to be on other fields, this one occasion seems to have been reserved as the crucial test of their fighting qualities. When they met the enemy, they fought hand to hand with a desperate valor that beggared description. The shot and shell of the enemy mowed down the front ranks of the colored troops like blades of grass beneath the sickle’s deadly touch. But, with a courage that knew no bounds, the men stood like granite figures. They routed the enemy and captured the breastworks. The courage displayed by young Holland’s regiment on this occasion called for the highest praise from General Grant who personally rode over the battlefield in company with Generals Butler and Draper. Holland was wounded in this battle but did not leave the field. Later in the day the regiment made a charge at Fort Harrison to relieve a brigade of white troops that was unable to get back to the Union lines. He served with his regiment at Dutch Gap until October 4th, when the regiment went over to Fair Oaks, or Seven Pines, where the Union forces achieved a victory of which they were afterwards deprived by a successful ruse of the enemy. In December, 1864, the regiment went with the great naval fleet under General Butler to Fortress Fisher at the attempt to break up the blockade-running. [When the] regiment landed at Fortress Fisher, they were compelled to withdraw on account of the insufficiency of support. They returned in January, 1865, under command of General Terry when this fort was captured. He was with his regiment on its marches through Wilmington, Bentonville, Goldsboro, and Raleigh. He was present when General Joseph E. Johnston surrendered to General W. T. Sherman, and it was here that his regiment received the sad tidings of the death of President Lincoln, when men of iron nerves shed tears like broken-hearted children. 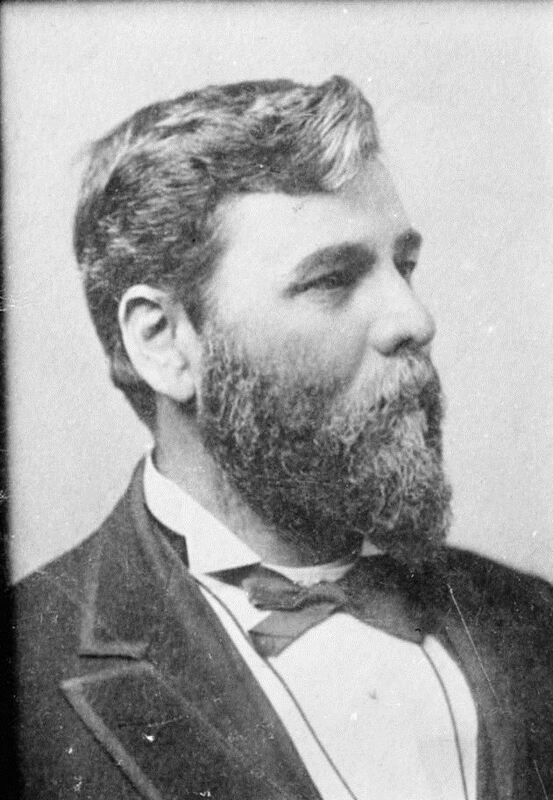 After the war, Holland was employed by the Federal Government, working in the Auditor’s Office. He was eventually promoted to chief of collection for the 16th District. In the late 1800’s he founded the Alpha Insurance Company in the District of Columbia, which was one of the earliest insurance companies in the nation owned and operated by an African American. 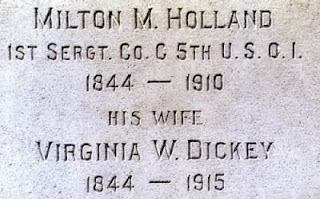 He died from a heart attack on May 15, 1910 and is buried with his wife Virginia in Arlington National Cemetery. Oh Jimmy, Where Art Thou? So judging from the amount of hits that this website has received over the past few months, it seems as if people have stopped checking in to see just where in the hell their beloved blogospondent has disappeared to. And I can hardly blame them! So since I have an off day today, I figured I’d fill you in on a little bit of what life has been like over the past 5 months or so. Passing the 13th Amendment is hard work. 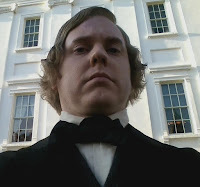 First of all, yes, the rumors are true – I was involved in the filming of Spielberg’s new Lincoln movie. I filmed for about 30 hours or so (not in one day, of course) and it was exhausting and exhilarating at the same time. Spielberg truly is a master at crafting a scene and explaining to both actors and extras exactly what he wants to see them do. The attention to detail that was put into the production was truly astounding – for Exhibit A, look at what they did to yours truly! I’m also serving as a historical consultant for the upcoming miniseries To Appomattox, which will be kicking into production this year! The New Market Heights book is selling well and I’m glad to report that it’s now available in a Kindle Edition! Saturday, February 25th we’ll be hosting John Hennessy in a program entitled "Bridging the Chasm: A Public Conversation about Slavery, the Civil War, and its Complicated Legacy," on February 25th at 12 noon at the John J. Wright Museum. Saturday, March 10th we’ll be at Battle of Hampton Roads, Mariner Museum. Saturday, March 31st at Museum of the Confederacy at Appomattox Grand Opening - We are one the color guards for this event 10:00 a.m.
I’ll also be speaking at the OAH/NCPH Meeting in Milwaukee on Saturday April 21, 2012 as part of a session entitled “Civil War Battlefields: Imagining the Possibilities after 150 Years" with Joan Zenzen, Robert Sutton, & Ashley Whitehead. 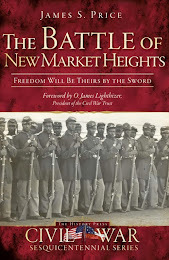 I’ve also been invited to speak at a symposium at Antietam National Battlefield on April 28, 2012 titled "The Dignity of Freedom: Pathways through the Civil War and Beyond," with Cheryl LaRoche, Edna Medford, Mark Neely, and Edie Wallace . Things are busy right now, but I promise – more good stuff will be coming on this blog! When John McMurray sat down to pen his reminiscences of his experiences as a Union officer during the Civil War, he was 78 years old. Originally written for his local newspaper, McMurray published his memoir in 1916, just four years before his death. McMurray had joined up in 1862, serving in the 135th Pennsylvania, the 57th Pennsylvania, and the 6th United States Colored Infantry. Yet it was his service in the last regiment that he took the greatest pride in – so much so that he titled his book Recollections of a Colored Troop. While it may surprise you that a former white officer would delight in calling himself a “colored troop,” it is worth remembering that approximately 7,000 white officers served in the USCT (supervised by the Bureau of Colored Troops) and that the vast majority of them underwent strict examinations at the Free Military School. It's an all-black movie. There's no major white roles in it at all. It's one of the first, all-black action pictures ever made. It's not Glory where you have a lot of white officers running these guys into cannon fire. They were real heroes. While Lucas was making a decent point about how Hollywood has largely ignored the important role that African Americans have played in many of the nation’s conflicts, I don’t think he had to disparage one film in order to promote his own. Please don’t think I’m saying that white officers in the USCT were somehow better than the men they led – there were some REALLY bad ones who treated their men like dirt (and in some instances shot them for the smallest infraction). But let us not forget that these officers also ran the risk of being executed by Confederates for inciting slave rebellion if they were captured. And at New Market Heights, where John McMurray received a brevet promotion to Major for his gallantry, the reason that so many enlisted men earned the Medal of Honor was that all of their officers had been killed or wounded and they had to take charge of their units and lead them through the rest of the battle. They were all real heroes too.